2 Sunny Decks, 1 space in the carport, one space in outside parking. Living Room with gas fireplace and flat screen TV. Entry adjacent to the forest. Front Deck, slider off the dining area. 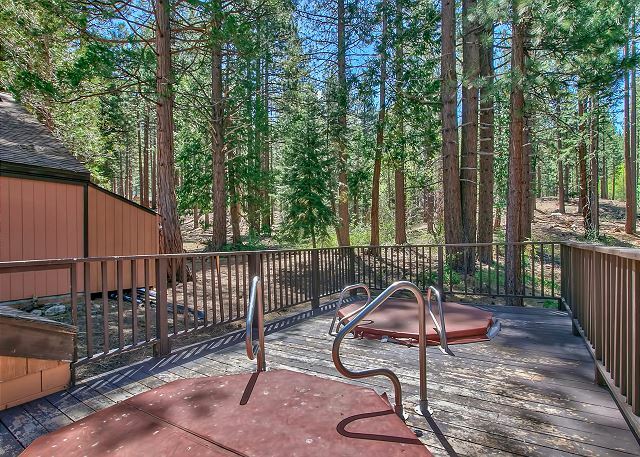 The Summit Tahoe Condo with a complex pool (open seasonally weather permitting, not open in the winter) and hot tub. This updated 2 bedroom, 1. 5 bath condo, is an end unit adjacent to the forest and across from the clubhouse with pool, hot tub, pool table, ping pong and exercise equipment. 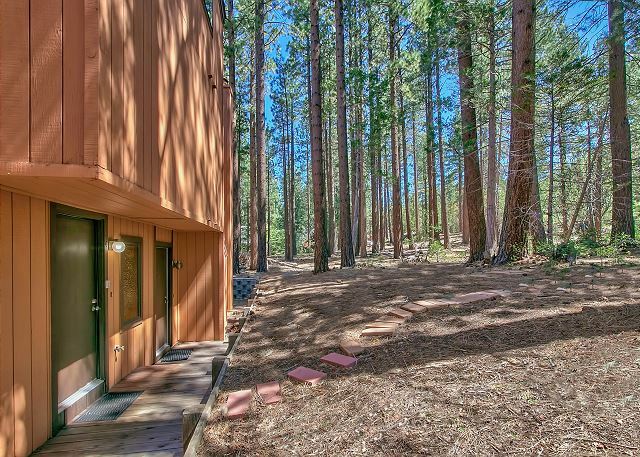 A few blocks to the Heavenly California Base lodge, 1/2 mile to Lake Tahoe and Ski Run Marina, approximately 1 mile to the Nevada side casinos. 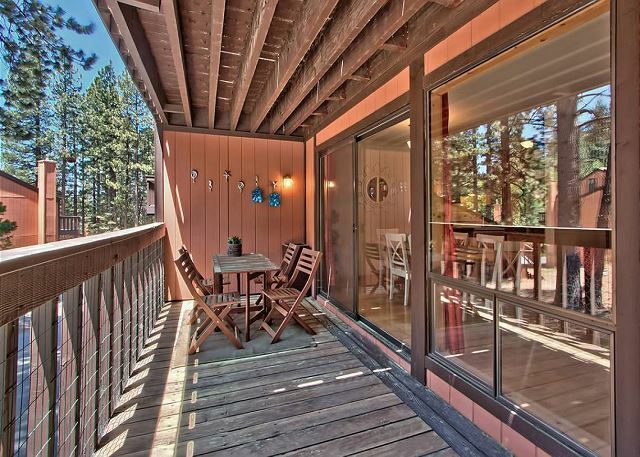 Come to the mountains and relax in this centrally located town home style condo. The living room, dining area kitchen and half bath are located up one flight of stairs. The third level has two bedrooms, full bath and a laundry room. There are decks off the living room and bedrooms. The living room has a pull out couch, flat screen TV and comfortable seating by the gas fireplace. 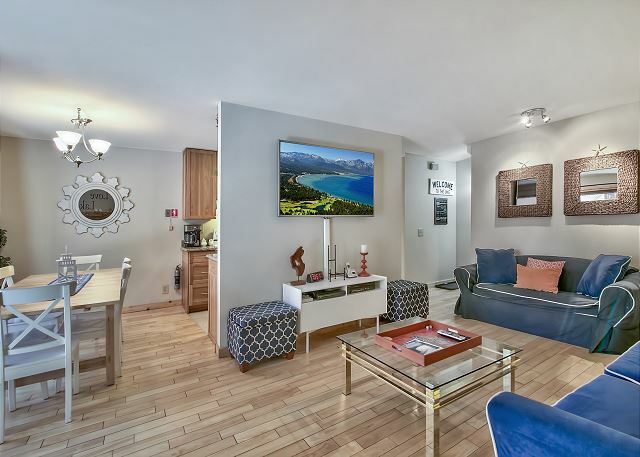 The well equipped kitchen features granite counters, flat surface electric stove, dishwasher and everything you need to create a vacation feast. The dining room table seats 6. The deck on this level has a propane BBQ. Upstairs you will find two bedrooms Bedroom 1 room has a queen bed and flatscreen TV. Bedroom 2 has a King size bed and flat screen TV (huge closet big enough for a small child to make a nest). Unit Sleeps 4 in beds, 2 on pull out couch, maximum occupancy 4. 1 cars allowed, one in carport and one in the guest parking area. Clubhouse with seasonal pool, hot tub, ping pong, pool table and exercise equipment is open 10:00am-10:00pm every day except for Wednesday when it closes at 5:00pm. Exercise equipment is basic: includes a stair climber, a rowing machine and a few weights. Living spaces are up one flight of stairs, bedrooms are on upper level. Thank you for the comments A few of the signs are regulations are mandated by the City of South Lake Tahoe. The other instructions are there because unfortunately not all guests follow the rules. We do appreciate your feedback though. Thank you so much! We appreciate the feedback and we look forward to having you visit Tahoe again--check the calendar it is snowing and skiing will be great. Thank you so much for the notes, we greatly appreciate it and hope you visit again. Next time you come contact us in advance, we have baby gates and high chairs available. Thank you! 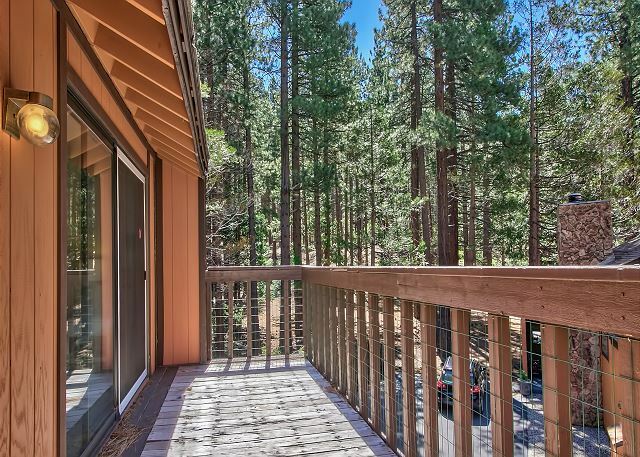 We are glad you enjoyed your Tahoe visit and we hope you stay with us again. Thank you for the comments, we appreciate the feedback. 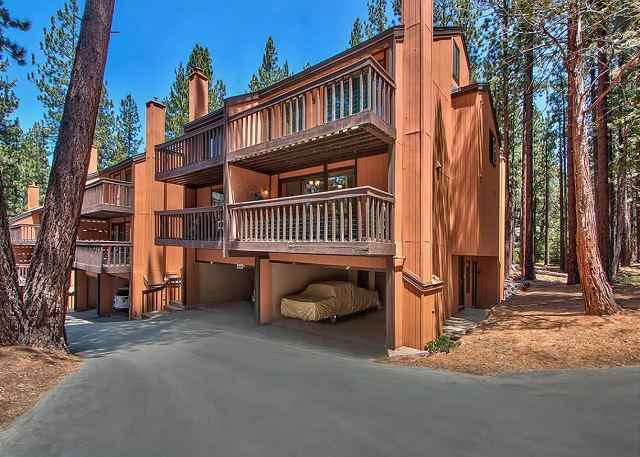 Yes this unit does have stairs, if you come back to visit Tahoe again let us know we do have a few units with no stairs. Thank you so much for the comments, we hope you stay with us again! I am so sorry it took a while to get the plumber to you, we are issuing you a credit for the inconvenience, we understand how hard it is when the main bath is not functioning. I am so sorry you couldn't find the sheets, wish you had called right away we would have made sure you found them or have brought extras to you right away. Thank you so much for the kind comments, we hope you stay with us again. Wonderful condo with exceptional inventory! Thank you so much for the feedback--I will remind the cleaning crew they need to leave sheets for the pull out, they are usually tucked in the cushioned bins in the living room. Thank you for the feedback we will share that with the homeowner. We did have a new gas fireplace installed this winter so hopefully the condo is warmer. Thank you so much, we are so glad you had a great visit to Tahoe. a guest from Phoenix, AZ does not recommend this vacation rental.